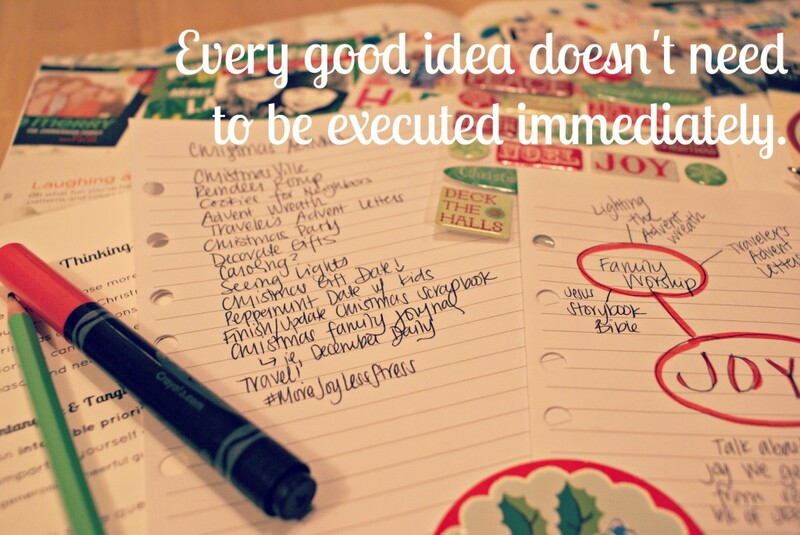 There are so many great Christmas activities, ideas, and traditions, but every great idea doesn’t need to be executed immediately. One way to choose more joy and less stress at Christmas and not find ourselves shoulder-deep in Christmas “have-to” is to have a family (or personal) priority to shape your Christmas celebrations. 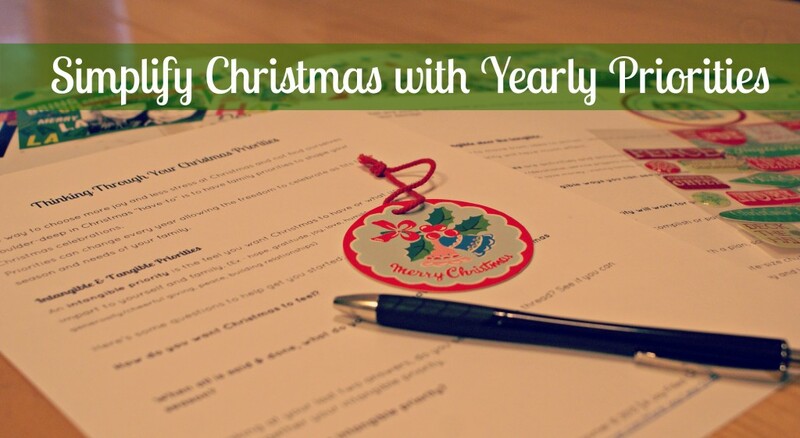 This priority can change every year allowing the freedom to celebrate as fits your family in that particular year. You’ll hear me say this over and over: every good idea doesn’t need to be executed immediately. It’s something we quickly forget amid our excitement of discovering a great new idea. How we make these great ideas and traditions work for us? By choosing an intangible priority and tangible priority for your family each year. As our families change and grow, we’ll find ourselves in different seasons of life and stages of growth. With each season our hearts and our minds will need, most likely, something new—whether to challenge, encourage, or inspire us in our walk to be more like Christ. Think of your intangible priority as the feel you want Christmas to have or what you want to impart to yourself and family. An intangible priority could be a focus on hope, gratitude, joy, love, humility, service, generosity/cheerful giving, peace, community (ie, building relationships). What are some ways to build your intangible priorities in your heart and the heart of your family? Last year my focus for our family was peace. With just having a new baby, still adjusting to our new town, and throwing our efforts into rebuilding our personal business, it was easy to let chaos and anxiety reign. But peace is not something we can build or touch with our hands. How do we, practically, impart peace this Christmas? This is where we move from idea into action. Without having a plan it’s not likely the intangible priority will have much effect. 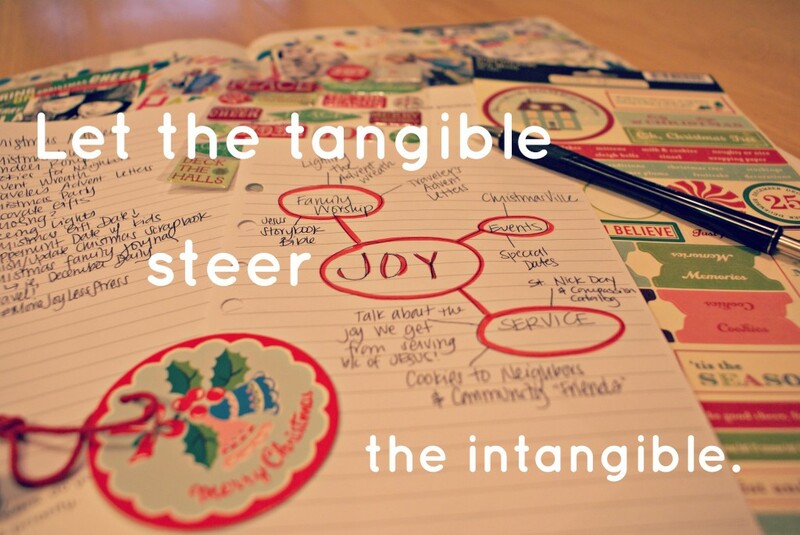 Let the intangible steer the tangible. 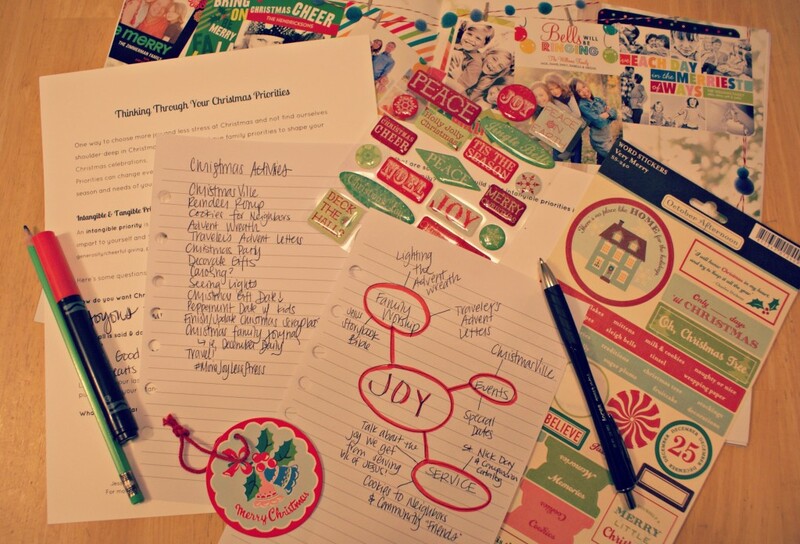 To help achieve that Christmas feel you’re aiming for let your tangible priorities be a means to move forward in your intangible priorities. Tangible priorities could be following an Advent calender/devotional, participating in service projects, homemade gifts, buying less presents so you can give to those in need (local or far away) or to save money , visiting family, or throwing a great party. If your intangible priority is to build closer relationships with extended family, then your tangible priority might be to visit family or plan special times with individual family members. If your intangible priority is pursuing hope, then your tangible priority could be going through an Advent devotional (Advent is the season of expectant hope as we wait for Jesus’ second coming). If your intangible priority is to be generous, cheerful givers, then your tangible priority might be buying less presents (or foregoing presents altogether) so you can give to those in need. For our priority of peace, my first goal was to have a calm, unhurried calendar. There’s plenty of Christmas activities in our community coupled with family and friends to gather with as well as activities and crafts we could do at home. It would be so easy for us to begin to pile these on top of each and find ourselves rushing from activity to activity packing up and dragging the kids along. But how does that help us achieve peace? How does that instill in our hearts and minds that Christ is our peace? My tangible priorities were limiting the number of events we participate in, use The Divine Hours for Autumn & Wintertime as a reminder throughout the day to return to Christ, and our evening lighting of the Advent wreath and Jesse tree reading. I want to leave lots of room to breathe in our family’s schedule and be intentional about spending quality, relationship-building time together. I think we achieved that, but even in the limitations I had given myself I still had to let things go. I think that’s the key to less stress: Be willing to let things go. Think about what you want your Christmas to look like. 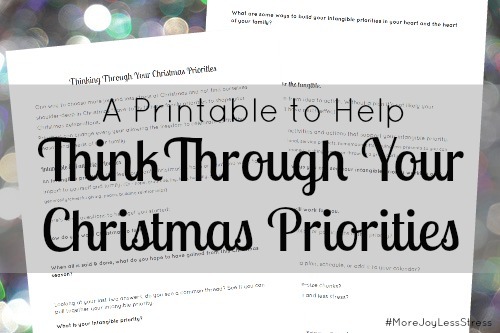 Print out a copy of the Thinking Through Your Christmas Priorities printable and start brainstorming your Christmas! I’d love to hear what you’re focusing on this Christmas, share in the comments.